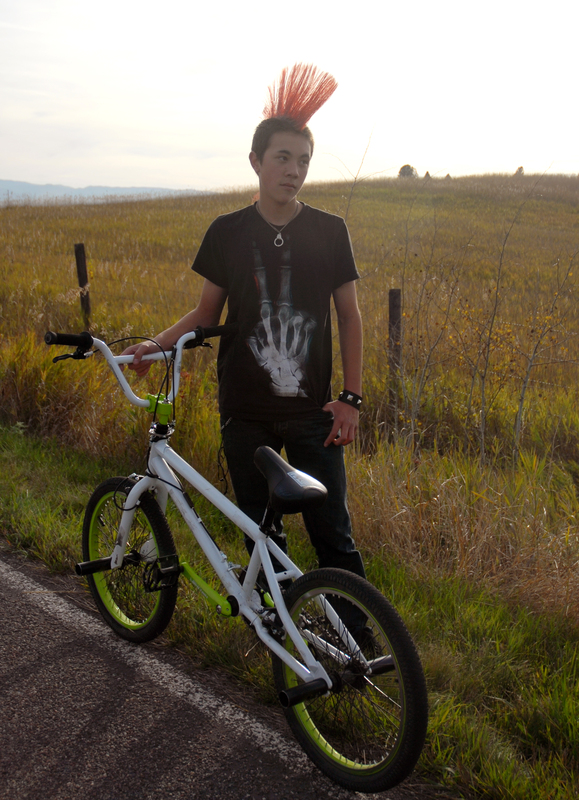 I was driving back home and I saw this kid on a bicycle on the side of the road riding toward me. Then I noticed that he was sporting a foot-tall red mohawk. We gawked at each other as I drove past (me at the mohawk, him likely at the Nebraska license plate). I drove about half a mile and said to myself, “What was I thinking!” and turned around, hoping he’d still be riding down the road. I found him, young Brandon, and pulled over. I coerced him (well, I think he was stoically excited, actually) into letting me take some photos of him for a feature photo in next week’s newspaper. What a good sport. Only had one person stop and ask if I needed help because my flashers were on (read: Are you trying to abduct this poor kid?). I love how random you are sometimes. I also love the mental image of people thinking you were attempting to kidnap this kid. People might also have found it suspicious that a 20-something-year-old woman was taking pictures of an innocent young boy. Mohawks in Montana. Who knew?